The general theme of the journal refers to the political sciences of international relations. The journal has an editorial board composed of prestigious personalities in the national and international field considering the standards of publishing scientific journals: the frequency, international editorial conventions (abstracts, bibliographic information, etc..) and keywords in English. 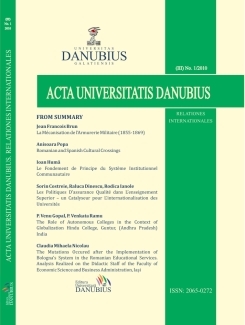 Based on a complex and modern approach, the journal can be found in field studies and articles on different lines of analysis noted: paradigms of international relations, European studies, interculturalism, migration, Diaspora and international relations, the internationalization of education, diplomacy, global issues of mankind. Since its first issue, the journal intends to be a debating court for promoting the spread of ideas and for widening the scientific dialogue critically examining various aspects of international reality and meeting the need for collaborative research in international relations.